I’ve been using the My Beauty Diary Black Pearl sheet mask on and off for about a year now, but this month I’ve been using them at least twice a week because of how dry and irritated my skin has been. It leaves my skin feeling so soft and moisturized, and I love how it comes with excessive amounts of essence. I usually just take whatever is left and massage it into my neck, chest, and wherever else on my body. I seriously cannot recommend this sheet mask enough for those with dry and lackluster skin. This sheet mask also claims to have whitening properties – not whitening in the sense that it would bleach your skin, but more like evening out the skin tone by lightening dark spots, freckles, or hyperpigmentation cause by acne scarring. I haven’t seen my dark spots significantly improve since using this mask, but my skin does look very radiant and bright the morning after. 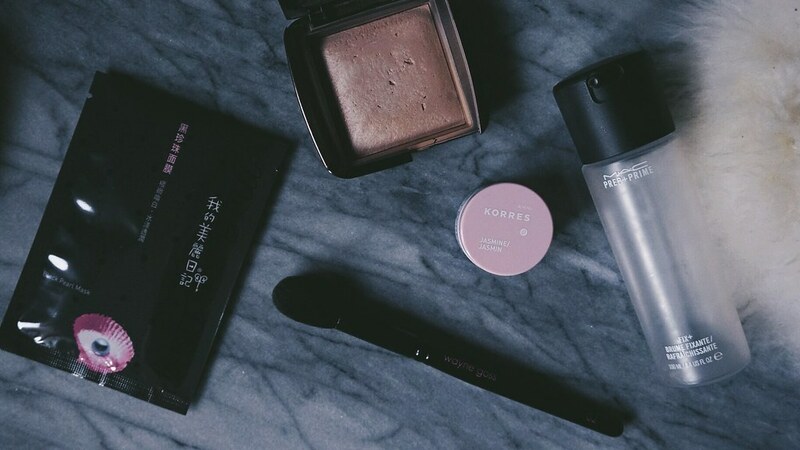 I’ve had great success with the Korres skincare lines, so when I noticed that Shoppers Drug Mart started carrying the lip butters, I jumped at the chance to try them. I just ran out of my Nuxe Reve de Miel lip balm (which would’ve been part of my Empties post if I had enough products to write about! ), so it was the perfect opportunity. I picked the Jasmine flavour – honestly I wasn’t really sure what I was expecting it to smell like, but I absolutely love it. It smells like a very faint warm vanilla/cotton candy/caramel. As for how it actually performs, it is a really lovely lip balm. I only wear it at night just because I don’t really like using lip balms in jars throughout the day because they’re impractical and unhygienic. It moisturizes my lips very well and it doesn’t feel thick or sticky. This is definitely an oldie but a goodie. I’ve had this same bottle for a while now, and it was only up until this month that I’ve actually been putting it to work. I love using this before I apply foundation and after I apply powder to set my foundation. It has helped my skin look and feel not as tight, cracked, and dry. It also feels so refreshing to put this on my irritated skin. I’ve also been using the Tatcha Luminous Skin Mist, however it’s honestly way too expensive to replace. I also find that the nozzle doesn’t deliver as fine of a mist as Fix+ does, so sometimes it leaves me with blobs of liquid which doesn’t look too great. I’m praying that MAC re-releases the limited edition scents they came out with last year so I can just stock up on this amazing spray. I just wrote a review on the entire Wayne Goss ‘The Anniversary Set’, which included this brush. To sum it up, it’s been wonderful using this brush to set my face. I’ve only been setting small parts with powder lately and using this brush helps so much with minimizing the irritation I sometimes experience with scratchy bristles. Yes – my skin has been that sensitive! It hurt so much just to touch my face, but the soft bristles on this brush are so gentle that it’s been one of the only things (besides the Fix+) I’ve actually enjoyed using. Continuing on with my dilemma that was my dry and extremely sensitive skin, this powder was one of the only ones I could use in order for my face to look half decent and not so reptilian. It worked well enough to set my foundation in place without sucking all the moisture out, but at the same time, it gave my skin a wonderful luminosity. I really enjoy the Ambient Lighting powder formula because they aren’t actually very powdery – in fact they’re quite soft and silky. I wouldn’t use this for my under eye area because they don’t hold up well enough to prevent creasing, but they’re wonderful for the rest of the face. What were your October 2016 favourites? Do you have any recommendations for dry and sensitive skin?